When Dito Montiel demanded that Jake Pushinsky be the editor on 'A Guide To Recognizing Your Saints' it was a tough thing to sell. Tough because, aside from a little short film, Jake had no experience in editing at all. But Dito insisted -- and after seeing 'Saints' you can see why. Pushinsky's eye for storytelling and his innovative techniques helped make the film one of the most memorable in recent years and one of my all time favorite movies. It's a collaboration that continued on this year's 'Fighting' starring Channing Tatum and Terrence Howard. Jake was kind enough to spare some time for an interview about his career so far - with particular attention being paid to 'A Guide To Recognizing Your Saints' - which just happens to be one of my all time favorite movies. Kid: I hear you've gone straight from 'Fighting' into cutting another project - didn't you feel like a break?. Jake: I actually took a 6 month break between projects. Fighting came out on April 24th but we finished the mix back in October. I started Howl (the project I'm working on now) in March. I think it's really interesting to find out how people get into the industry. What was your route into the film industry? Did you plan to be an editor? I grew up playing jazz piano and always thought I would be a musician or do something in the world of music. When I finished college I moved to LA to pursue that and got a job at a music house for television commercials. This is where I met Dito Montiel - the director of Saints and Fighting. He was writing the script for Saints at the time. My father was a screenwriter so Dito and I would always talk about his script, send it to my father for ideas, and talk about how it would be great to make the movie someday. I had no idea what my role would be though. One day during all of this we decided to go film some stuff and make a sort of trailer/short that he could send out with the script. Dito had a friend with a camera and we got some friends together and shot a day's worth stuff. We took the footage back to our office and loaded it in to Adobe Premiere. We used Premiere at the office to load commercials so the composers could watch them as they wrote the commercials so I knew the very basics of the program. With that I cut together a 7 minute short that we called 26 Moments. Wow... this is turning in to a sort of long-winded story. Anyway... Robert Downey Jr. is a friend of the owner of the office we worked at so we gave him the script and the short. He loved it, wanted to be a part of it, and brought it to Trudie Styler (Sting's wife). She loved it too and wanted to produce it. 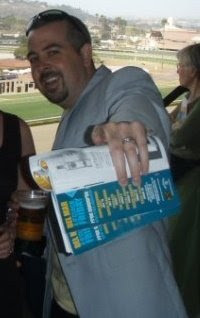 A couple of years later when the money came through, Dito convinced them to bring me on as the editor. It was the first time I sat down at an AVID. So no, I had no plans of becoming an editor but I am very happy that I am doing it now and really love it. Well, originally they hired another editor because he couldn't convince them to hire me, but they didn't like how that was going, so he asked again to just give me a chance. After pleading and pleading, they flew me out to NY to give it a try. That makes it sound A LOT easier than it was. It was definitely a process! 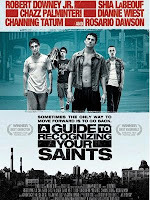 The majority of my questions are around 'A Guide To Recognizing Your Saints' - one of my favourite films. With a few years having passed, what do you th ink of it looking back? Are you happy with your work? Looking back on Saints I still am beyond proud of it. I think it's a real piece of art. I wouldn't change a thing... Though the original ending (the last scene with Eric Roberts) that I cut was a little longer and some people wanted it shorter. I still think the longer version was better. You share the editing credit with Christopher Tellefsen. How did the collaboration work between the two of you? Working with Tellefsen was interesting. Dito had to push hard to get me on the film. I had never done anything before so I understand why the producers were skeptical. They brought Tellefsen on because they thought I couldn't do it on my own. Dito and I did our thing though and now we have a great movie. My favourite scene in the film is when the older Dito returns home and sees Laurie for the first time. If you were to give this scene to a film student they would probably rip it to pieces; lots of zooming, erratic camera movement and your cuts are jumping all over the place. But it works. It's really moving. How do you edit a scene like that? That scene was actually the first scene I cut and it pretty much stayed the same from day 1. As I've said, I had never cut anything before so I didn't know any "rules". I didn't know what crossing the line meant. I still remember when Anthony Ripoli (the greatest Assistant Editor out there, and now an editor too) came to me and said, "you can't do that, you're crossing the line." I had no idea what he was talking about. I still don't really get it. If it feels right, it feels right. If it doesn't, it definitely doesn't. But back to the scene... Editing to me is all feeling. I always go to performance first. If the actors don't feel real, the scene won't feel real and then movie doesn't feel real. Dito and I are always trying to get the real emotion out there. Ask anybody that hasn't been to film school if it bothers them when the line is crossed - there will be no response. But if you ask them if they are bothered by a bad performance? I don't know if there's a person out there that isn't. The film is obviously a very personal thing for Dito. Rather than a movie, it feels like we've accessed the Writer/Director's mind. How closely did Dito work with you in the edit? Was he there all the time or did you have time to play with the material yourself? Dito and I are very good friends and we've worked together long enough now that we think alike when it comes to the movie making process. I usually come up with a version of a scene on my own and then we sit together and tweak it until it's perfect. The scene when Monty collapses is extremely powerful. And looking at how it's edited it's very simple - cutting repeatedly to black, with music as the only sound. Was this in the script? Cutting to black in the seizure scene was definitely not in the script. It actually happened by accident. I had some clips in the timeline that I knew I wanted to use but wasn't sure where so I slid them to the end and out of the way. When I was watching what I already had (up to where the first black comes in) I forgot to hit stop and the black came up, music kept playing, and then another shot appeared. I thought, wow, that's pretty cool, let's go for it. So I finished cutting the scene and played it for Dito and he was sold. I still remember the first time Shia (LeBoeuf) came by the cutting room and we played that scene for him. He literally jumped out of his chair and ran out of the room. Because of how emotional it was? Exactly. It was the first time he had seen anything from the film and had no idea what to expect. I think he was just blown away by all of it. Another scene is when Dito bumps into Irish on the train as they talk about going to Coney Island -- it's one of those scenes that if I was to screen it at a film school they'd probably think I'm on drugs; it's all out of sync and seemingly random. But in the context of the film it fits perfectly. How did you come to edit it that way? The original idea for the scene was sort of based on something we had used in 26 Moments - the first short we did. That was the dirt spot. But on set Dito wasn't feeling overly confident about the how the scene was going so he had the actors, Shia LaBeouf and Martin Compsten record the dialogue in an almost whispering voice. Just the audio - no cameras rolling. He didn't know what would come of it, but thought I would come up with something. I started with the dirt spot image and some music and then started adding the voices and any images that looked good - another scene that didn't change much at all from the first cut of it. It really came down to feeling. If it feels right, it is right. I really like that you edit based on feeling. And it's quite telling that often your first cut of something is the one that sticks. Do you find it hard to have a fresh mind on scenes that you've been staring at in an edit for months? How do you overcome that? At times it can be difficult but I try to take little breaks as often as possible. Even if it's just a quick walk around the block - it always helps to step away for a moment. Again, it's a feeling, so I always know if something doesn't feel right. And if that's the case... Change it. After 'A Guide To Recognizing Your Saints' - you edited a few other projects. What were those?. I did a documentary called Chops. It's a really great film that I hope people get to see eventually. It's about teenage jazz musicians from Jacksonville, Florida. They play in school jazz bands together and get a chance to go to the Essentially Ellington competition (an international high school jazz band competition) at Jazz at Lincoln Center in New York. Some day it will get out to the public. And then I cut a film called Columbus Day - starring Val Kilmer. It was a fun project while it lasted. The financiers put a hold on it and I'm not sure what ever ended up happening to it. I've heard you can download it online some where. Was it strange to be editing on your own? Did you feel prepared for it? I've pretty much been cutting on my own since I started. Even on Saints, we were on 2 different floors of the same building - working seperately. So how exactly would you characterize your working relationship with Tellefsen?How much input did he have on the movie? Chris was around quite a bit but we were on different floors of the same building. Dito would go back and forth between us. The final versions of everything always came through my room though. ..and how did you work with Saar Klein, on 'Fighting'? Saar came on to the movie about 6 months in to the process - after the "director's cut". The studio wanted some fresh eyes in so Saar came on for about 7 or 8 weeks to take a look at things. We changed a few things while he was there and after we did a test screening that went very well, Saar left. 'Fighting' is your second feature with Dito Montiel. But I'm guessing this project is was a lot different to work on compared with 'Saints.' How does the job as an editor on a low-budget feature compare with a Studio film? The main difference is comfort. On Fighting, I was in a bigger room, with a 72 inch flat screen monitor and 2 assistants. And there are a lot more opinions on studio films - a lot more people involved who have a say in the final product - and usually with more of a business mind than an artistic mind. Everybody wants every movie they make to be seen by an audience or they wouldn't be making it. In the studio world, they decide who that audience is before the film is made. In the independent world - or at least in the arty independent world - you just hope there is an audience that enjoys your piece of art. Do you have a preference, artistically? Artistically, in my experience, independent films seem a little better. There just seems to be a little more freedom as an artist. Fighting opened really well at the box office, is this something you anticipated? Also, by working on financially successful projects - is it going to be less common that you'll get to work on smaller independent films? Dito and I always shoot for the stars so we were hoping for number 1 but we'll take a successful number 3. I just want to work on GOOD films. Independent or studio is nowhere near as important as good! But of a random question - does the film editor have anything to do with how the trailer is cut? If not, does it bother you seeing someone else cutting your movie up? I've never had anything to do with the trailers that have been cut for the films I've worked on. It's a very different art, and one that I really respect. After cutting a film down to an hour and a half, I have NO WAY of thinking I could turn it in to a two mintue movie. I've tried and it just doesn't work. I love seeing what they come up with though. Have you improved as an editor? I would say I probably have. At least I hope so. The goal is to always get better. I just never want to lose the gut instinct that I had on Saints. I think that's where the true magic comes from. 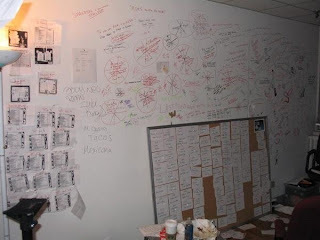 (The room where Jake edited 'A Guide To Recognizing Your Saints'. What was the toughest scene to edit in 'Fighting'? There's one scene where Channing Tatum's character and Terrence Howard's character get in to a pretty big argument. We had a little bit of a tough time getting to escalate to the climax naturally. For a while it was feeling like it was coming out of nowhere or that it wasn't a big enough reaction. I think what we ended up with feels pretty genuine though. It definitely works in the film. Are the actual fighting scenes difficult to work with or is it something you enjoy? The fight scenes are great. They were a lot of fun to cut. I found out quick that the biggest thing in movie fights is the acting by the person who's getting hit, not the person throwing the punch. Most people can learn to throw a punch that looks pretty real, but it's very difficult to act like you're getting hit for real. The actors all really went for it though - no stunt men. Channing got hit quite a few times. Personally, I think they are some of the most realistic fights to ever be in a movie. So I take it you kept a few of those real hits in? Actually, no. I was surprised to find out that real hits don't look as good on screen as fake ones do. I was sure they would make their way in but nope - all acting - except for Evan Hailey's (played by Brian White) head against the window in the final fight. That's as real as it gets! What is your process for editing.. do you work a certain amount of hours each day? When I'm working I tend to get a little obsessed with the project and put everything in to it. On Saints, I probably worked close to 7 days a week from about noon to 3am. It was INSANE but we were on a Sundance deadline that couldn't be missed. I definitely like working in the middle of the night. That's when I get my best work done I think. But it's also something that can't really be forced. If it's not happening, I take a break or step away for a little while. It is an art, so if I'm not feeling in to it, I think it shows in the work. I'm working on a great film right now called Howl. It stars James Franco as Allen Ginsberg, and is being directed by Rob Epstein and Jeffrey Friedman. It's about the poem Ginsberg wrote called Howl, and the obscenity trial that was held about the poem in 1957. Also, Dito and I have a couple of things we're trying to get off the ground. They're both scripts that Dito wrote. Can you tell us anything about these? Is one of them 'Son Of No-One'? Son of No One is one and Eddie & Judy (aka The Clapper) is the other. Son of No One is a thriller-drama about a cop whose past is coming back to haunt him. Eddie & Judy is a love story. None at all. I think it's definitely the hardest job in Hollywood and I don't want much to do with it. I love being on set but I don't want that job. How about composing? are you moving away from that now? I haven't written a piece of music since "A Sunny Stroll" for Saints. My wife and I are planning on getting a piano at home soon and once we do, I hope to start playing a lot more again. What advice would you give to someone wanting to become an Editor, someone who perhaps doesn't have the contacts or live in L.A.? I would say start cutting! Do whatever you can to get your foot in the door. Go to film schools (enrolled or not) and find student directors who need editors for their projects - anything. I imagine getting in to film school is great. You probably learn a ton and you also make endless connections to people that are heading in to the business. You just have to put yourself out there to anybody and everybody that you can. It's a really really hard business to get in to. I'm probably not the best example because I got lucky and sort of fell in to it. Who was responsible for the Cat Stevens 'Trouble' montage in AGTRYS? It wasn't in the script right? That was definitely not in the script. Dito and I both had a hand in that. We were having a hard time getting from one scene to another and just started playing around with all of the footage that wasn't being used anywhere else. On set Dito had each of the characters look at the camera and introduce themselves. He had no idea where it would be used or if it actually ever would be used. I started with Giuseppe walking in to the bathroom with the radio and originally I had a Nina Simone song there. It felt good so I started putting the kids introducing themselves and it was great but the song wasn't quite right. Dito suggested "Trouble" and there you have it. Thank you so much for taking the time to do this, it's been really fascinating. I'd like to end with a few quick questions.. Right now... Probably '25th Hour'. What aspirations do you have outside of editing? Producing. Look out for GoodForYouFilms. How best can I convince you to cut my first feature? A great script? huge paycheck? hot female assistants? The awards at Sundance. Nothing has topped that yet. Can we see '26 moments' anywhere? Unfortunately not. I only have one VHS copy of it and it has a bunch of unlicensed music on it so we've never put it out there for people. We tried our best to get it on the DVD extras but didn't have any luck. 'Fighting' is out in cinemas now, 'Chops' has also been released. 'Howl' is expected some time in 2010. I was watching 'Jaws' (Spielberg, 1975) and the brilliance of these few scenes hit me in a way it hadn't before. It's a masterclass in acting from Roy Scheider and subtle directing from Steven Spielberg. It's the moment in the film where Chief Brody really realises the gravity of the situation he's in. In the moments leading up to these scenes he is elated when the fisherman have brought in a shark - which he is of course convinced is the killer. And then he is confronted by the woman whose son was killed. "I just found out that the girl got killed here last week. And you knew it. You knew there was a shark out there.. you knew it was dangerous, but you let people go swimming anyway. You knew all those things... but still my boy is dead now." The minute she speaks - you can see the guilt in Brody's eyes. He doesn't have to say a word. In fact, his face barely moves -- but you can feel the weight of the situation and the guilt he is carrying. "Come here, give 'us a kiss." In the next scene he is having a personal, touching moment with his son. He barely says a word. He feels responsible for the death of the little boy - yet here is he now with his safe and healthy son next to him. Again, Scheider barely does a thing; it's all in the eyes. "Martin hates boats. Martin hates water. Martin... Martin sits in his car when we go on the ferry to the mainland. I guess it's a childhood thing. It's a... there's a clinical name for it isn't there? When Hooper (Richard Dreyfuss) turns up, Brody is just quietly amused. The occasional wry, painful smile. As Hooper talks to Brody's wife he just sits there between them, mulling a million things over in his head. 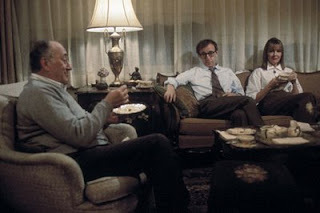 He pours himself a large glass of wine before giving a small glass to his wife and to Hooper. Up until this point, he's hardly said a thing. As Ellen, his wife, tries to think of the word for his fear of water; Brody jumps in with "drowning," before going in to a very specific question about sharks, which he directs at Hooper. In these few minutes alone we see Brody's character and purpose completely change. It's a change that informs the rest of the film. Suddenly, the man who has been afraid of water all his life takes to the water without complaint. He has a job to do, it's the only way he's going to beat the guilt that's building up inside of him. Incredible filmmaking from Spielberg, with heartbreaking music from John Williams. But most of all - Roy Scheider lays himself bare in these scenes-- what he does with his eyes and only minimal dialogue is incredible.